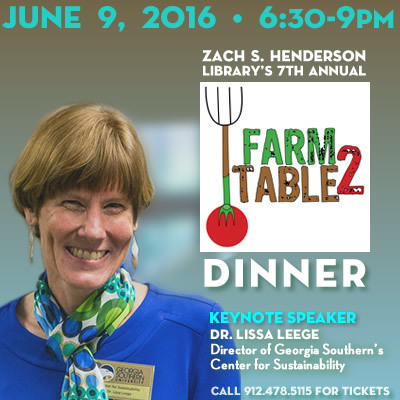 Join Henderson Library as we celebrate our 7th Annual Farm to Table Dinner on June 9. This year’s event will be held at the Belle House in Statesboro. Dr. Lissa Leege, Director of Georgia Southern University’s Center for Sustainability, will be the keynote speaker, and Dr. Michael Braz will be entertaining during the cocktail hour. Tickets are $75 each and may be purchased by calling Henderson Library at 478-5115 Monday through Friday between 8 am and 5 pm, or you may stop by the Dean’s office, Room 3213.